Cologne - The Bundesliga continues to lead by example when it comes to welcoming refugees into Germany. As part of FC Schalke 04’s #StandUp campaign to help refugees arriving in the country, all 60,083 fans at the Veltins Arena took to their feet and held up placards conveying messages of support ahead of the Royal Blues' game with 1. FSV Mainz 05 on Sunday evening in Matchday 4's final game. 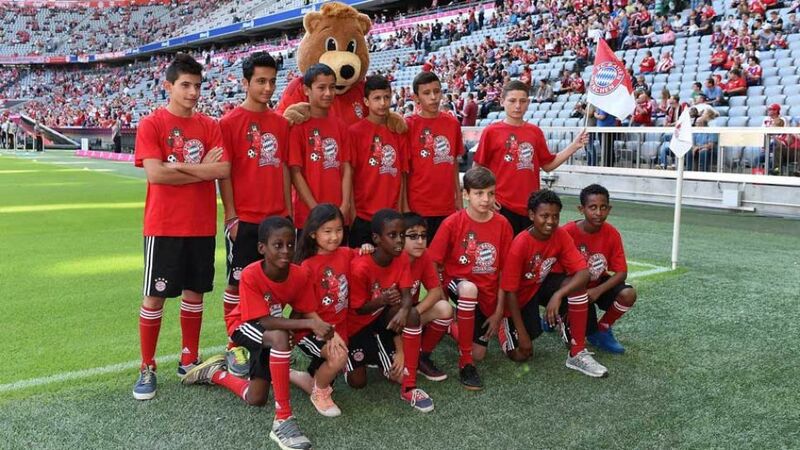 Ahead of kick-off in Saturday's Bavarian derby at home to FC Augsburg, the FC Bayern players took to the field at the sold-out Allianz Arena, walking hand-in-hand with two mascots: a local and a refugee child. As well as driving home the importance of integration in the wider context, the club provided the youngsters with an unforgettable experience a world away from their recent struggles. "FC Bayern has a socio-political responsibility to help the fleeing, needy children, women and men, to support them and welcome them into Germany," explained Bayern chairman Karl-Heinz Rummenigge last week. The record German champions have already pledged one million euros to set up a training camp and provide help for the wave refugees arriving in Bavaria. The Bundesliga's capital outfit have adopted a like-minded stance. "Our club is multicultural, colourful and inclusive - it was obvious that Hertha would help," affirmed Hertha sporting director Michael Preetz after it was announced around 1,000 refugees from Syria, Afghanistan and Pakistan would be attending Saturday's game against VfB Stuttgart. "There are children, families, women and men, who have had such a terrible time, living just around the corner from the Olympiastadion. Perhaps at Hertha we can do our bit to help them forget about the pain and exertions of the last few weeks - at least for two hours." As well as match tickets, Old Lady club mascot Herthinho has also been busy handing out toys, footballs, T-shirts and scarves at the nearby Horst Kerber sports centre-turned-refugee shelter. "We're overwhelmed, it was such a fantastic surprise," said Friedrich Kiesinger of Albatros GmbH, the firm that supervises the operation. "Anyone who saw the glint in the children's eyes knows what I'm talking about. A trip to the game against Stuttgart is going to provide the people with a wonderful distraction." Continuing the Bundesliga-wide theme of unparallelled generosity, Wolfsburg have also invited approximately 1,200 refugees to their UEFA Champions League group stage opener with PFC CSKA Moskva on 15 September. Additionally - along with 80 other teams competing in this season's Champions League and UEFA Europa League - the Wolves have confirmed that they will donate €1 from every ticket sold for the game to the crisis, with proceeds set to be invested in refugee projects in the wider region of Lower Saxony. It is not the first time Wolfsburg have made such an altruistic gesture. The club are actively involved in refugee-based initiatives, having previously staged training sessions specifically for political asylum seekers in the local area. Furthermore, VfL players walked onto the pitch hand-in-hand with child refugees for the final game of the 2014/15 season against 1. FC Köln last May. After FC Bayern München donated €1 million to help refugees in the Bavarian capital, Thiago Alcantara is doing his bit for the cause by putting a pair of his Nike boots up for auction. VfB Stuttgart, meanwhile, are one of a handful of clubs opening the doors of their training complex to refugees in the south-west state of Baden-Württemberg.